Tomorrow is the big day. 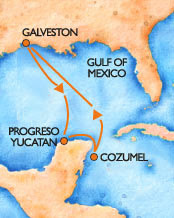 Our ship leaves at 4 p.m., and our first stop is on Wednesday in Progreso, Yucatan. We will be in Cozumel on Thursday and back to sea on Friday for our arrival back on Saturday. Laura is already having a wonderful time with Meme and Don-Don. I know she is gonna have a great time being spoiled. I'm looking forward to eating good foods, sunbathing, reading books and spending time with Jim. Just sitting here in rainy South Arkansas, thinking about you soaking up the sun! Hope you're having a great time! We are excited for ya'll! Hope you had a great time!